With less than 20 weeks left before Microsoft stops serving security updates to most versions of Internet Explorer (IE), Windows users last month finally began ditching the soon-to-be-retired editions in significant numbers, data released yesterday showed. Out of the blue a year ago, Microsoft told most IE users that they had to be running IE11 by Jan. 12, 2016. After that date, Microsoft will support IE9 only on the little-used Windows Vista and Windows Server 2008; IE10 only on Windows Server 2012; and only IE11 on Windows 7, Windows 8, Windows 8.1, Windows 10, Windows Server 2008 R2 and Windows Server 2012 R2. Also on the support list was the new Edge, exclusive to Windows 10. The penalty for ignoring the order: No more browser security updates. Until August, users had been slow to react to the mandate, migrating to IE11 at the leisurely pace of about 1.8 percentage points in user share on average each month since Microsoft's went public with its upgrade-or-else demand. But last month, assisted by the debut of Windows 10, 6.5% of those running a Microsoft browser adopted a safe-harbor version. User share is a measurement generated by California-based Net Applications, which tallies unique visitors to its clients' websites, then reads browser agent strings to estimate the online user percentages running a specific browser family or the editions among such families. For example, according to Net Applications, 52.2% of the world's online users ran IE in August. Through August, 49.6% of all instances of a Microsoft browser were IE11, Net Applications said. Substantial fractions of the user base, however, continued to run versions slated for shutoff, notably IE8, which accounted for 20.2% of all browsers built by Microsoft. But IE9 (12.9%) and IE10 (7.9%) were also used by substantial fractions of the Microsoft browser world. Discounting IE9 and IE10 because they will be supported only on small-volume platforms -- Vista, the largest by far, powered just 1.8% of all personal computers in August -- collectively the at-risk users accounted for 42.7% of those now running Internet Explorer or Edge. That's an improvement over the 49.2% in July, thanks largely to Windows 10's upgrade roll-out and the OS's default browser, Edge, which accounted for 3.8% of all Microsoft browsers, up from a measly 0.2% the month before. IE8 appears to be the version that will be the hardest for users to eradicate. While its share of all Microsoft browsers fell by almost 4 percentage points in August, the largest decline since last October, the six-year-old application still was preferred by more than one in five Microsoft browser fans. IE8 is unlikely to drop beneath the share of XP among all versions of Windows -- which was 13.4% last month -- because it's the latest edition able to run on the now-unsupported operating system. But then, XP users haven't received security updates for IE8 since April 2014 anyway, so the January 2016 cut-off will be meaningless to them. Computerworld continues to predict that, based on the rate of decline in the up-for-retirement IE editions, more than 30% of those running a Microsoft browser in January will be severed from security updates. 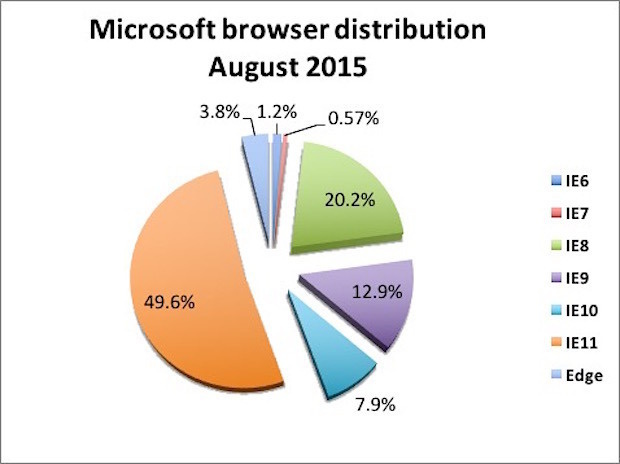 The two safe harbors come January 2016, IE11 and Edge, accounted for 53.4% of all Microsoft browsers used in August.